Latest Job Vacancies In Air Canada. Air Canada is Canada's largest airline which was established as long ago as 1937. Providing charter and schedule air services for cargo and passengers to over 180 destinations all over the world, it is the 8th largest passenger airline in the world by its fleet size. Headquartered in Quebec, Air Canada's biggest hub can be found in Toronto at the Pearson International Airport. Well over 30 million passengers fly with this airline every year in its fleet of modern aircraft and there are over 1500 flights every day. 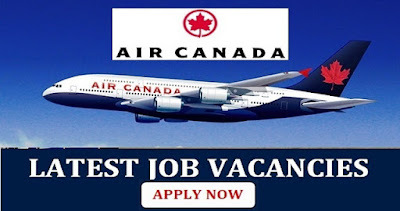 Air Canada is an extremely large and prestigious employer, so if you are interested in the latest job vacancies in Air Canada you will need to know more about the types of vacancies available and also how to go about applying. There are positions available all across Canada as well as elsewhere in the world, so there are many exciting opportunities to suit a range of candidates. There are both full time and part time positions available as well as temporary and permanent roles. The best place to search for the latest job vacancies in Air Canada is on the airline's own website. Here you will find their Careers section which lists all of the current vacancies across the world and in all of the available sectors. You can perform a search using a range of criteria including location, job field, posting date and language. What Skills And Experience Are Necessary? The level of experience and skill required for jobs at Air Canada will vary depending on the position applied for. For an entry level position such as a cabin cleaning operative, no formal educational qualifications are necessary and although relevant experience would be beneficial it is not necessarily required. Bilingual candidates who can speak both French and English fluently are often given priority, however in any case good communication skills are essential. For more senior roles such as a management role, a relevant degree will be required as well as relevant significant experience. Depending on the position, candidates may need to have good computer skills, an ability to lift heavy objects, a driving licence and an ability to work well in a group. Many roles require the applicant to be a Canadian citizen. A high standard of appearance and grooming may be required for some customer contact roles and for positions such as cabin crew, applicants must be able to reach a certain height without shoes and must have no visible piercings or tattoos. It is easy to apply online for vacancies at Air Canada through the airline's own website. You simply need to set up your own application account and then submit your personal details along with your current CV. An airline representative will review your application and will invite you to interview if you meet the relevant criteria.